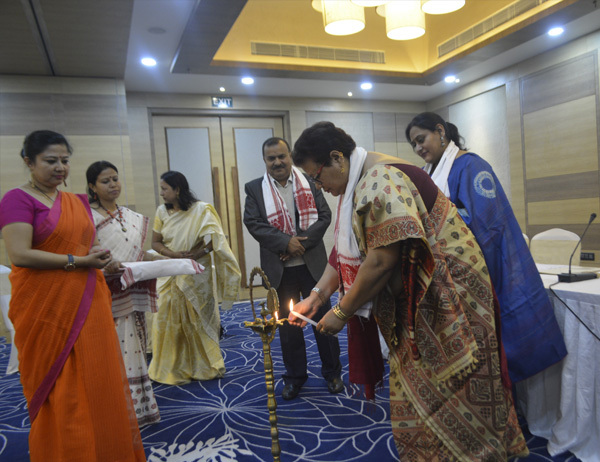 The Assam State Commission for Protection of Child Rights (ASCPCR) organized five Zonal Level Sensitization Workshops in the state covering various districts, with special focus on Child Trafficking towards the later part of 2017, in Collaboration with District Child Protection Units and supported by UNICEF, Field Office for Assam. The commission strongly felt the need for such workshops after assessing the scenario in the region for a while. Human Trafficking is the most despicable form of violation of human rights. Human trafficking has been a recognized crime and considered to be one of the largest crimes all over the world which is difficult to be numbered because of its hidden nature. In India, the North-East states, with many remote and backward areas in respect to infrastructure, economy and illiteracy, has seen a rise in child trafficking in recent years in spite of government and civil society efforts to curb the menace. According to data recorded by the National Crime Records Bureau (NCRB), Assam was leading the country in 2015, in human trafficking cases. Assam registered the highest number of cases in trafficking of children during 2015 along with the highest rate of incidence (11.2) and the highest percentage contribution of 37.7% to the all India total. The data shows that the number of cases registered under child trafficking had increased from 330 in 2014 to 1317 in 2015. A detailed analysis if the data shows that the number of trafficked girl child is more than the boy child across from 2012 to 2015. However, there have been rescue operations, and a total of 911 children were found and rescued in the year 2015. As per Report of UNICEF on Secondary Data Analysis on Trafficking of Women and Children in Assam (2013), 3679 persons were either missing or rescued from exploitative situations. The number is much more, but cases are not registered/recorded in the local police stations. However, trafficking is an issue and subject very lucidly understood and leniently dealt at times which is visible in operation. The definition of trafficking as mentioned u/s 370 of the Criminal Law Amendment Act, 2017 widens the scope of understanding the subject and to identify and book actions and doers. The issue of trafficking needs to be addressed by a comprehensive strategy so that the trafficked/survivors/vulnerable gets justice and rehabilitated. Considering these situations and to stop children of the state from falling prey to the menace of trafficking, the Assam State Commission for Protection of Child Rights in collaboration with UNICEF Assam launched a Project on Stop child trafficking and ensures justice to the survivors of trafficking. The project took up a series of activities which included visits to the source areas and districts and meeting with the Community and various Stakeholders to collect firsthand information. The community and stake holders information thus, have been planned to be discussed at the Zonal Level Workshops which will be attended by the district and police administration, CBOs, PRIs, DCPUs, CHILDLINE and all concerned agencies and stakeholders which would come up with findings and would further culminate in the form of State Level Workshop for addressing at policy level. ➢ Sensitization at all levels of the society and mobilization of government machineries for justice to the victims. ➢Education and livelihood opportunities for the trafficked survivors/vulnerable for rehabilitation and mainstreaming in the society. ➢ Monitoring of the implementation of Right to Education in all concerned. a. To understand the situation and key vulnerabilities of children and their families in the context of issues like, labour, marriage that lead to trafficking. c. To identify key bottlenecks in addressing right to education and come up with concrete recommendations. e. To develop strategies for carry forward to the Government to stop trafficking of children and ensuring justice and rehabilitation measures for the traffic survivors. •	Overview of the concept of Trafficking with special focus on Child Trafficking. •	Challenges in Rescue and Rehabilitation of victims of Trafficking and the role of CBOs/NGOs in combating Child Trafficking. •	Presentation on Role of PRIs/ULBs/Community Leaders in curbing the menace of Child Trafficking. •	Key Issues Pertaining to Child Trafficking and role of Stakeholders in combating Child Trafficking- Towards Seeking Convergence. •	Laws, Schemes and Policies to combat Child Trafficking. •	Situational Analysis of Child Trafficking with special reference to the participating districts.